The other day I read a very intriguing poem on one of the blogs I follow called What Do Ya’ Reckon? The poem was titled “Is It True“. Is there really Climate Change? What do we lose if we say ‘yes’ and we’re wrong? What do we lose if we say “no” and we’re wrong? …the end of life as we know it. This poem, which I read through several times to absorb the full meaning, got me to thinking about what I was taught in school concerning the planet Earth. I also thought about all the knowledge I have gained from visiting various National Parks like Yosemite, The Grand Canyon, Lake Tahoe, Brice, Arches, Zion, Death Valley and many others. Most National Parks have Visitor Centers which present theories on how the surroundings came about. From visiting Yosemite National Park I learned the valley was carved by a glacier. 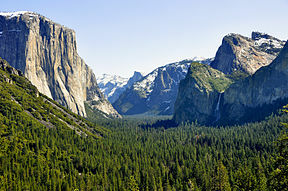 If you have ever visited the Yosemite Valley, you know that had to be one very large ice-cube to cut a valley through solid granite. Mount Diablo, which is part of the East Bay Regional Park District, is east of San Francisco and has an elevation of 3848 feet. Sea shells have been found on its slopes. 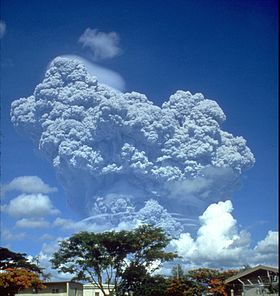 When Mount Pinatubo erupted in 1991, the global temperature dropped by about 0.5 °C (0.9 °F) due to all of the ash it expelled into the atmosphere. So based on the evidence, what I have been taught in school and from what I have learned while visiting our wonderful National Parks, I believe the earth has warmed. I also believe it has cooled. But I also believe it is beyond man’s ability to control or change the climate, whether it is warming or cooling. I believe our ecosystem is so complex that man will never be able to take into account all of the different variables that control the Earth’s temperature to predict what will happen in the future. The weathermen and meteorologist can’t even tells us accurately what the weather will be in seven days! I can’t help but wonder if any of the climate scientists have considered that there are more people than ever living on planet Earth and each day all those people produce carbon-dioxide and methane gas? It’s interesting…I DO believe there is climate change and I suspect that humans are playing a significant role in it. But, from where I’m sitting, it’s a bit like playing Russian Roulette with ‘life on Earth’ to say that ‘there is no climate change’ since SO MANY studies are tending in that direction…and how can it hurt to take a hard look at ourselves and try to clean up our act a bit? Even it there isn’t climate change, cleaning up our act will indicate that, as a species, we’re maybe maturing a bit and taking responsibility for our action…I’ll get off my soapbox now. Thanks again for reblogging me. True…which suggests a “World Government”…are you ready to go there?